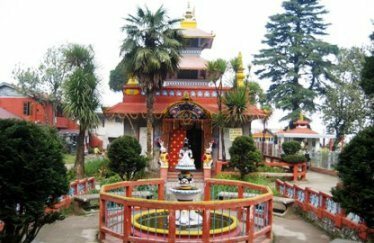 The beautiful Nepali-style Dhirdham temple is a Hindu Temple of Lord Shiva located south of the Darjeeling market center and just below the Toy Train Railway Station. It was built by Purna Bahadur Pradhan in the year 1939. Pradhan was also known as Rai Saheb, a title given by the Viceroy of India in 1936. The temple was designed by the Gorkhali architect Beg Raj Sakya. Rai Saheb wanted to create a replica of the Pashupatinath temple of Katmandu, Nepal. The temple looks like a multi-layered pagoda from outside and resembles the Pasupatinath temple in architecture. As you enter the temple premises, you will see a white colored statue of Lord Shiva facing the temple near its entrance and surrounded by a short height concrete fence. This form represents the five different expressions of Shiva with his universal third eye. There are trees and shrubbery all around making the entire premise look really nice and attractive. You feel a sense of holiness and serenity as soon as you enter the temple compound. Inside the priests are warm and welcoming to one and all. They are generous in bestowing blessings to the worshippers and even to casual visitors. Don't forget to get a signature 'bindi' (a spot of vermilion powder on the forehead) that represents the blessings. While you can take photographs outside the temple, cameras are not allowed inside. 'Arti' or the regular prayers take place every day at 8am and 6pm. Just below the Darjeeling Railway Station. There is no admission fee.